Grow narcissus, or paperwhite, bulbs indoors if you live in a cold winter climate location. Plant them in the winter and force the bulbs, making a lovely display during the holidays. If you live in a warm winter climate, USDA plant hardiness zones 8, 9 or 10 (see Resources), plant your narcissus bulbs outdoors and enjoy them during their natural spring blooming. Mix the proper soil before planting your narcissus bulbs to give them a healthy start. This plant prefers a well-drained, loamy soil. Dig the soil down about a foot in a sunny spot toward the end of the year, usually September to December. Take out any stones or other debris. Add 2 inches of compost and work it into the soil, before raking the area even. Plant the bulbs with the proper depth and spacing to avoid overcrowding. 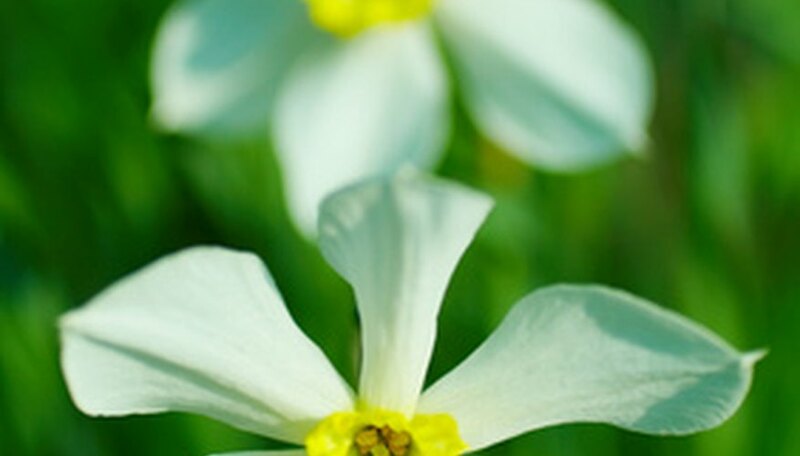 Narcissus appear most attractive when they are planted in bunches, 5 bulbs to a square foot. Plant them about 3 inches deep with the points facing upwards. Water the area right after planting. That should be enough moisture until spring arrives, unless winter is especially dry and warm. If this is the case, water once a month until it rains. After the bulbs sprout through the ground, water once a week until the blooms die off. Cut the narcissus stems and leaves only after they have turned yellow and brown. Before this time, the bulbs receive nutrition from the greenery, where it is stored for winter months. Fertilize the bulbs with a food specifically manufactured for flower bulbs with the amount suggested on the package. Spread the fertilizer over the ground around the narcissus in late fall. Water directly after feeding so the food reaches the bulb.